Bust the lines with a fully mobile POS! How Medisave successfully deployed a walking point of sale at the Dallas AHA show. Medisave is a global internet based supplier of medical supplies. 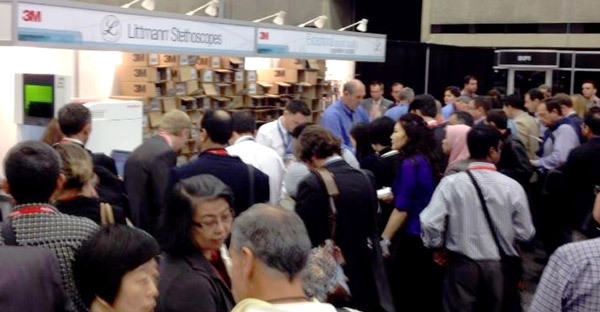 Twice a year we attend two large medical shows in the USA in partnership with 3M Littmann Stethoscopes. The conventions are held in large convention centers where space is constrained and at a premium. Our sole purpose at these shows is the sale of personalised Littmann Stethoscopes. These are actually sold and personalized with laser engraving right there on the stand. In the past, our POS solution (after our first naive attempt consisting of pen and paper!) involved clunky laptops running Microsoft POS in parallel with USB barcode scanners, networked printers, and manual credit card terminals. The shows are incredibly busy with up to 1,000 sales over a two-and-a-half day period. We always had to deploy a minimum of three manned registers, in part due to the time wasted rekeying the same payment information on the laptops and the credit card terminals. The solution was robust and served us fairly well but we always felt it could be better. This year Littmann Stethoscopes decided to attend a lower profile show with us. The stand size was less than half the size of previous events and there was physically just not going to be enough room for all of our laptops, scanners, printers and credit card machines. We had two months to find a new, leaner solution! We looked at every iPad based solution from Shop Keep to Vend. On the payment side we looked at everything from PayPal Here to Square. Have a look at the pros and cons below. 1. Global Payments VeriFone cellular PDQ. We have used this solution for several years, it’s a standard offering from most banks and uses a GPRS cellular connection to approve or deny each authorisation in real-time. Our contract with the bank allows us to call off terminals and agreements for one month at a time. However for most small businesses expect a setup fee and a 12 month contract.We paid around $20 a month to rent. Transactions fees were directly within a corporate merchant account which generally worked out at around 1.8% for a basic Visa card and rising to 2.4% on Amex. With huge variations in between and above this for corporate cards and foreign cards. Its very hard to actually find what the rate ends up as. We feel that this option is probably the cheapest – however it actually ends up quite close when the range of cards are accounted for. It’s extremely well proven technology across many years and retailers. The GPRS has never failed to work for us in any location. It supports Pin and Chip. At many of our events we have non USA customers and for many of these their card will only work with the card inserted with Pin authorization. It’s powered by a rechargeable battery and portable.Simple to use and works straight out of the box with no configuration. Its standalone which means each transaction and amount has to be rekeyed on the unit. The customer also gets a separate receipt (which in practice we take extra time stapling to the POS invoice). The end of day settlement is manual. If you need to find a transaction error or manually reconcile you can end up manually copying data in to a spreadsheet! The ecommerce side of our business is a long time user of PayPal as a secondary payment method. With this in mind we probably had a great deal of bias towards trusting this payment method. No Contract or Monthly Fees. Swipe – All major cards at 2.70%. Manually Entered at 3.5% + 15c. Great Reconcile options and filters. Instant settlement for established businesses. Great chargeback management and procedures. Support for IOS and Android. POS aspects of the service are very weak – even on the iPad version. There does seem to be continuous updates to this though – so expect this to improve. No chip and Pin on the USA PPH device. Merchant needs to give a lot of personal details to PayPal such as Social Security numbers etc. SquareUp has been around for a while and we looked at this solution for a long time. However the deciding factor was the lack of integration with our chosen POS. Easy to setup with next day payment deposits. However we had read quite a few forum posts about delayed security checks and delayed payments etc (and this did cause us some caution). Great Reconcile Options – Log in for CSV etc. Support iPad, iPhone and Android.Ability to authorize payments with the devices 3G / 4G. At the time of deciding the free POS element with the Square account was quite weak with no inventory tracking. However Square have recently updated this. No Pin / Chip Support. Although listed as a Pro – the ability to authorize payments over the devices own cellular connection – this can be problematic for our type of use. The exhibition centers are very busy and we have noticed that at lunch times and break out periods these connections can grind to a complete halt. In the end we chose Vend and PayPal Here. During testing they seemed to work together extremely well, along with the peripherals. Everything just worked. Reason: Wireless internet access is often (but not always!) provided by the convention center. However, it is rarely reliable due to the understandably intense usage during an event like this. We wanted to be self-reliant and bring our own private, reliable connection with us. Reason: These tiny devices slot into the headphone jack on the iPads, barely adding anything to the form factor. It works seamlessly with the Vend app, plus the huge worldwide brand awareness of PayPal as a payment solution gives the customers (in our case from a huge range of nationalities) confidence. Reason: Lightweight, small form factor (though seemingly drawing on the design aesthetics of a 1980s Sony Walkman), wireless, and can be clipped easily to a belt for hands free operation. The device spews out the receipt the moment the transaction is complete. Reason: The small form factor allowed us, along with the bluetooth peripherals, to literally take payment anywhere. We could walk down the queues, take customers aside, and generally manage and control the crowds much more effectively. Reason: Whilst still mobile if need be, the stand allowed us to have a hands free counter-top system to run in tandem with the roaming POS. Reason: Again the small form factor and the cordless operation were the main appeal. The scanners can be attached to a lanyard leaving your hands free when not in use. The Series 7 are also fairly robust in construction and scan well, even through the plastic bags we were using. Reason: Cloud based, so we could add or replace devices (we took along laptops and extra as backup, though they weren’t needed) with no additional setup. It can be accessed directly via the web or by iOS apps from the Apple store. The system is simple, keeps inventory, and works smoothly with everything else. And so we come to the important part – did it work? The answer is a resounding ‘yes’! For all three days of the show this system worked flawlessly. We didn’t need any of the backup or extra equipment we brought – these two POS processed the same amount of orders as previous shows at stands twice the size. In addition, the agility it gave us allowed us to keep the hectic crowd levels under control, and the speed allowed our customers to get back to their conference with minimum waiting times. This is easily the best POS solution we have deployed and we definitely be using it for the foreseeable future. The Cardiology IV is Here!